Come visit the Monnit booth at INTEROP in Las Vegas Nevada, May 10th – 12th at Booth #2555. Visit the INTEROP show website at http://www.interop.com/ for more information. Email us if you would like to setup a meeting while we are there. Monnit was featured in a research article by technology market intelligence company, ABI Research. The article focuses on Monnit Wireless Sensor Systems for customer companies that aren’t interested in how wireless sensor networks work, just in what can be accomplished with them. The full text of this Insight is available to subscribers of the Wireless Sensor Networks Research Service. Understanding the Battery Graphic in the iMonnit™ User Interface. Monnit offers two sensor products with different battery options. The Monnit WIT is our least expensive, and most common sensor line and is powered by a CR2032 lithium-ion battery and has 250mA hours worth of energy. The Monnit WIT2 is powered by two AA lithium-ion batteries and provides the user with 3,000 mA hours worth of energy. Monnit uses linear interpolation for all values between the given points. For example, a battery voltage of 2.95 is between 2.9 and 3.0. The battery percent is half way between 75% and 100% (or 87.5%) so the display will be rounded to 88%. Because the power reservoir is small in the CR2032, the voltage can fluctuate between reads. This can cause the reading to change from 50% to 0% by only having a .15V drop at the time of the battery read. For example, if the network encounters any interference and the sensor has to transmit more than once, the battery will display lower than subsequent readings that didn’t have to send retries. A benefit to AA batteries is that they will show a much smoother curve as the batteries drain due to the larger power reservoir. Using wireless sensors to monitor resort boilers and water heaters. It can be expensive to maintain boilers and water heaters at resorts. How does your maintenance staff monitor boiler temperatures for changes and know if there are water leaks in or around boilers and water heaters? With Monnit WIT Wireless Temperature Sensors and Wireless Water Sensors you can have 24/7 monitoring of your boilers and water heaters to track temperature fluctuations and detect water leaks, allowing you to catch failures before they have time to become costly repairs or replacements. Enjoy the peace of mind that comes from using Monnit wireless sensors to help manage your resort. « View More Information. 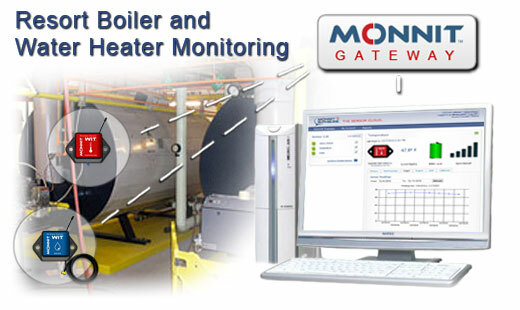 Catch Boiler or Water Heater Issues with Monnit Wireless Sensors.